The 93-year-old co-founder of Twycross Zoo, who was a passionate defender of exotic animals, has died. Molly Badham helped build the largest collection of primates in the world at the zoo, located on the Leicestershire-Warwickshire border. 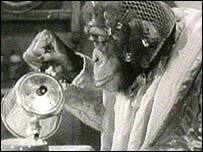 She began taking in chimpanzees in the 1950s and was well-known for training the chimpanzee stars for tea adverts. In 2002 she received an MBE for her services to the conservation of endangered species. Mrs Badham established Twycross Zoo in 1963 when her menagerie outgrew her small bungalow. She started running a pet shop in Sutton Coldfield before setting up the Twycross Zoo in 1963 with business partner Nathalie Evans. Mrs Badham often kept baby chimpanzees at her home and would feed them with bottles and dress them in nappies. The chimpanzees in the tea advertisements were dressed in clothes and rode bikes - and loved to drink tea. The revenue raised from the PG Tips advertisements was used to help pay for the running of the zoo. Speaking about her tea-drinking chimpanzees, she said: "Another could pour tea without spilling it. And they loved riding bicycles. Tea parties used to be a highlight both for the chimps and visitors to the zoo." 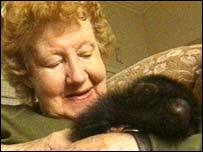 Mrs Badham once shared a flat with zoo co-founder Nathalie Evans and they had two chimpanzees living with them. One day they returned home to find the chimps throwing clothes and other belongings out of the window to a crowd gathered in the street. She worked for decades with exotic animals and was a member of the International Union of Directors of Zoological Gardens. She published two books: Chimps with Everything in 1979 and Molly's Zoo in 2000. In 2003, she moved from her home in Norton Grange to Tree Tops bungalow on the grounds of the zoo.